One rabbit wakes up. Then another. In the magic light of the full moon they see stories reflected from another world…. they see stories reflected from another world. A world tied to their own, but far in the distance. to bring different worlds closer together. And the courage to cross it themselves. 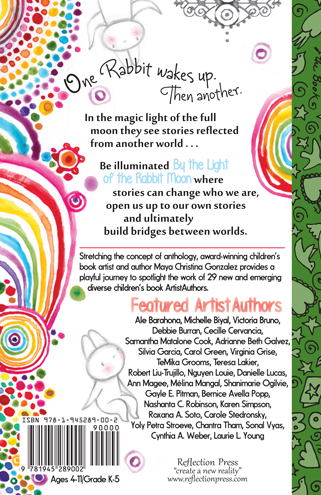 Be illuminated By the Light of the Rabbit Moon where stories can change who we are, open us up to our own stories and ultimately build bridges between worlds. 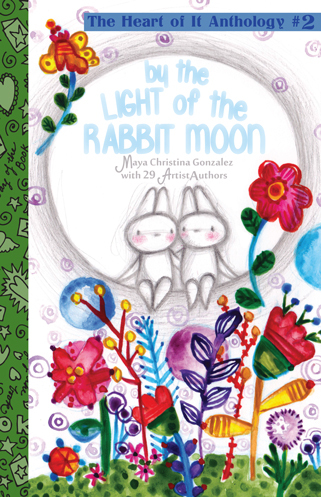 Continuing to stretch the concept of anthology, award-winning children’s book artist and author Maya Christina Gonzalez takes us on another playful journey through story in this second book for the Heart of It Collection. 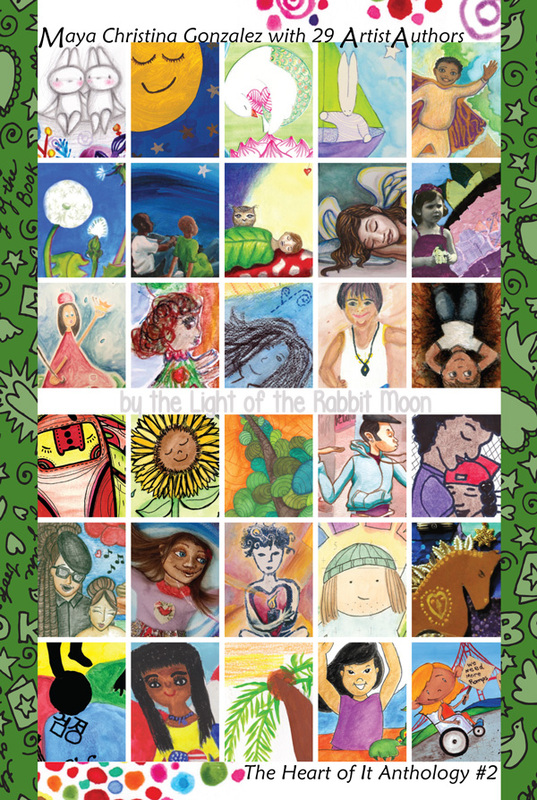 A fresh and wordless tale spotlights the work of 29 new and emerging diverse children’s book ArtistAuthors. Stories about nature, magic, identity and love abound. All provide seeds and possibilities to inspire kids to tell their story, share their art and know that in both the telling and the listening, our stories have the power to bring worlds closer together. 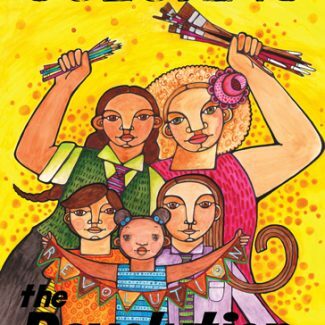 This book is the second in The Heart of It Collection: annual anthologies in direct and immediate response to a lack of equitable and relevant representation of the people in traditional children’s books. 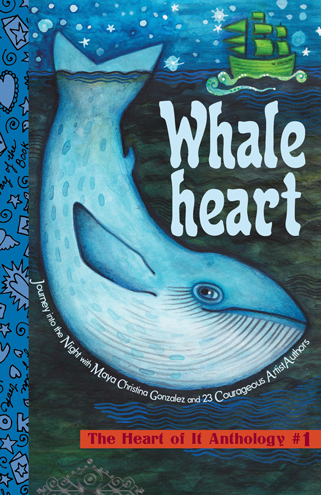 After taking Maya’s course, The Heart of It: Creating Children’s Books that Matter, aspiring and emerging ArtistAuthors are invited to put the teaching into real life practice through the process of creating one full spread for The Heart of It Anthology for that year. Over the course of 4-5 months students are guided through developing their story and art to be published. 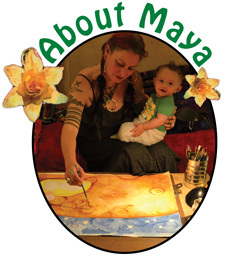 Step-by-step submission packet and videos, scheduled reviews by Maya as well as encouragement to review course materials support students to more deeply integrate the process of creating art and story for children’s books. The whole experience offers the opportunity to learn the balance between creative expression, honing one’s craft, and the ability to follow through and how important that balance is to making truly powerful books for our children. Emerging and established authors and artists who shared their wisdom through the course’s Community Spotlights are also invited to submit work. 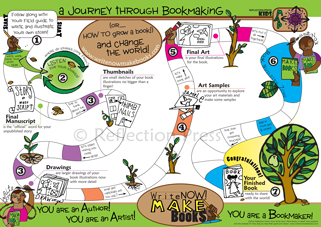 The final book is then used as a tool to support ArtistAuthors in getting their work out into the world and transform who creates children’s books and how. Sales of the book also support future ArtistAuthors as proceeds are put towards offering more scholarships for The Heart of It course providing a cyclical environment of mutual support. and your innate ability to create your own image! THE REVOLUTION IS ALWAYS NOW! For Kids! Want to get started on your own book? Visit Write Now! Make Books to download your field guide and get started sharing your story and art! Victoria was born in Chile. Mother of two beautiful daughters, educator and self-taught artist, Victoria loves working with children and seeing how creativity takes place. Victoria dreams of a world full of colors where everyone can shine at the same time! Cecille is a mother, artist, teacher, writer, and musician. She was inspired by her own experiences to write and illustrate stories that reverberate in the hearts of those who can relate. Cecille is passionate about life, and shares that zeal where a rainbow of colors and descriptive storytelling meet. Adrianne is a bilingual teacher and social justice activist. She loves children and animals. She asks questions to learn new things. She enjoys traveling, dancing, music, photography, yoga, reading, writing, and listening to other people’s stories. Adrianne lives in Hillsboro, Oregon with her dog, Kona, and her cat, Frida. Silvia is from Guadalajara. She is an entrepreneur and storyteller. She enjoys having time for family and art. This is her second collaboration, which is a reflection of how a small being can self-define. She is convinced that giving yourself permission to write a story is liberating. Carol fell in love with children’s books while reading to her now grown son. A cartoonist, television producer, writer and production publicist on movie sets throughout the U.S. and Canada, she now takes her own baby steps through the labyrinth of children’s books to impart love, hope and self-esteem. Nguyen is Chinese Korean American. She was born and raised in Oakland, California. She spent most of her life coping with dyslexia and overcoming the stigma of being called a dumb, slow “Sailboat Reader”. Her brain is hardwired differently. 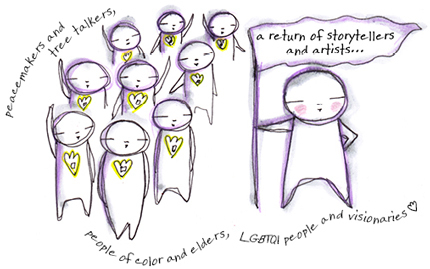 Nguyen celebrates multifaceted narratives and likes to tell stories with pictures. An Advertising Art Director born in Florida but grew up in Spain. Danielle has since followed the moon to far away lands, living and traveling around Europe, the Middle East and South East Asia. Her playful and inquisitive four year old has inspired her to venture into children’s books. Ann loves how the caterpillar’s transformation into a butterfly is a metaphor for life. Because she’s an identical twin, she values individuality and understands the struggles of trying to be yourself. 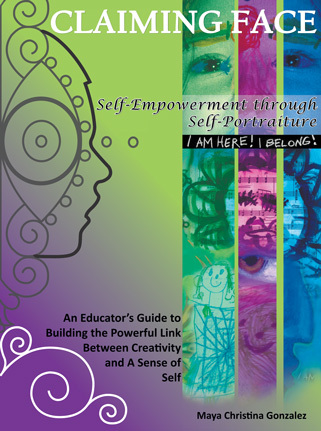 She loves being a mom, educator, poet, photographer, children’s author, and life-long learner. When she isn’t working in a school library, Mélina enjoys biking, hiking, reading, writing, and watching karate movies. This is her first illustration. Ever. Shanimarie grew up in Jamaica and has a passion for teaching. She is also an elementary educator and instructional coach who enjoys learning and laughing with her students. She remembers playing under mango trees in Jamaica. This is her first literary contribution and has other writing in the works. Bernice loves children, gardens and books. A retired first and second grade teacher, she believes children need to plant gardens where they can read books and feel close to nature. Bernice is happy to be part of this anthology. It has been her life-long dream to write a children’s book. Nashanta loves to write stories and read books. As a young author, she won many story writing contests in school. She also likes to draw even though she is shy about showing others her art. Today, she works as an educator and has three children of her own. Karen’s favorite books as a child were always about horses. Writing, fabric art and working with animals are her passions. She is an acclaimed quilter and has taught quilting to both children and adults for over twenty years. Karen is also the author of an award-winning novel. Words are Roxana’s favorite thing in the whole wide world. She’s written so many of them that she’s lost count! Recently, she discovered that art is pretty cool too and now she’s working on her own children’s book, which she can’t wait to share with the world! Carole loves to imagine sailing into the night sky on adventures with magical animal friends, so when her son was little she wrote Moon Rabbit for him. Carole now has a service dog, Hazel, and they are working on a series of picture books about their adventures together. Yoly is an artist, mother and teacher who enjoys getting messy and creative. 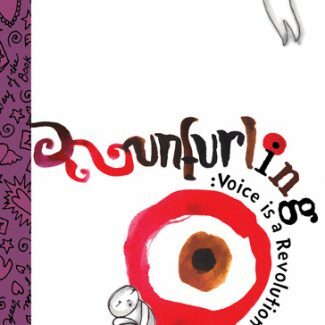 She has several published works but this is the first published piece she has created specifically for children. She is waiting for her wings to dry off before she heads off on her next adventure. Sonal is an adventurer who loves to explore near and far. As a school social worker, she nurtures children’s development as they explore and discover who they want to be in the world. Sonal aspires to set free her first children’s book. When Cynthia isn’t strolling the seaside or wandering the woods, she’s in the garden. Nature holds magic, but in the garden, she creates magic and inspiration for Emma Jean And The Magic Bean. Working with bilingual kids, Cynthia created the Emma Jean Series. She has taught Art, Art History, and English. Laurie is still growing up and still writing stories and drawing pictures. She has written six preschool books, including her favorite, I See A Monster, and has several new projects in the works, including a middle grade novel.